Let My Joy be your strength, says the Lord. I want to give you real joy for your mourning. I will give you the garment of praise for depression. I do not want you overwhelmed with sadness. I do not want you to grieve. Come into My presence and allow Me to wrap My everlasting arms of love around you. Let Me comfort you in all your sorrow. I want to turn all of your sorrow into My unspeakable joy! I want your joy to bubble up in you so that you laugh at the enemy that had been taunting and mocking you. Give it back to him, says the Lord. Go ahead and tell him that He is not going to steal your joy or ruin your day. He is not going to torment you with gloomy thoughts. Just tell him that you are not going to allow his negative thoughts to consume your mind. Let My mind be in you, says the Lord. JOY IN ME. I Am the God of your salvation. Come and joyfully draw out of the well of salvation. 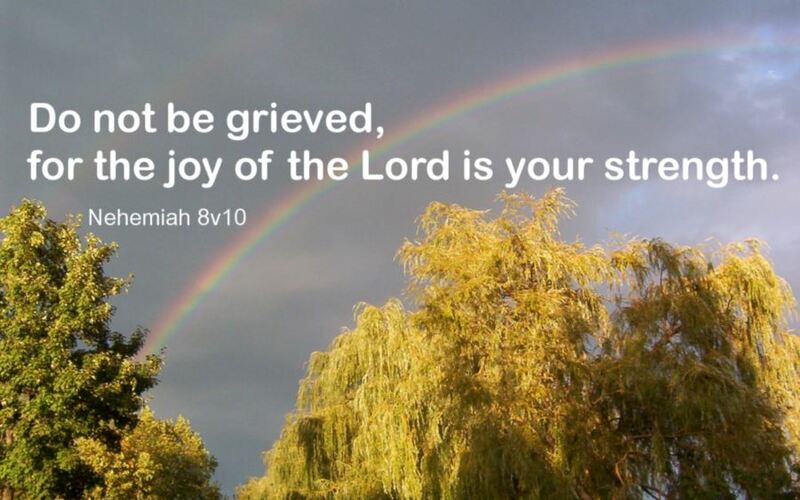 It is everlasting joy that I have for you, that your sorrow and mourning will flee away, says the Lord. Come into MY presence where there is fullness of joy. Don’t rush out. Be filled with My Spirit of joy so that it not only consumes you but changes the very atmosphere around you. Others will wonder how they can have what you have. You will be able to minister to the wounded and hurting and suffering from the overflow of My Spirit, says the Lord. You have cried long enough. Away with the tears. It is time for you to rejoice. Shout for joy, for I Am with you always. You can depend upon Me. Let your heart be filled with gladness! Let the light of My presence force out the darkness, dispel all the fears, and defeat every purpose of the enemy! I will cause your heart to sing for joy. It is a new day! I have created it for your pleasure. Rejoice in it, says the Lord, for My joy is your abiding strength.